"This #blackhistorymonth, we're sharing unpublished photos from the @nytimes's archives. This is the oldest image in our #UnpublishedBlackHistory series: a sidewalk scene in Harlem from 1946. 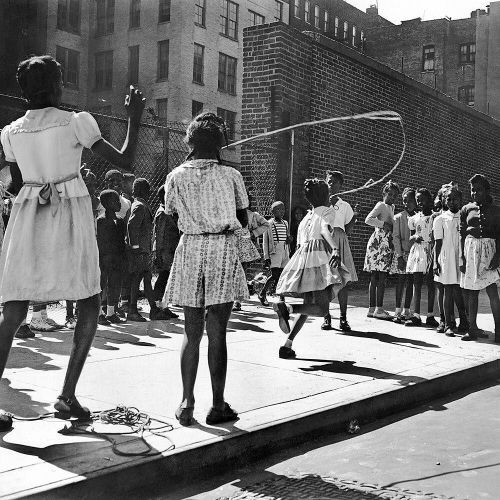 A girl skips rope amid a crowd of children on a lazy summer afternoon. But what's most striking is the woman who wasn't captured by the camera's lens. That woman was Zora Neale Hurston, the novelist and folklorist known as the Queen of the Harlem Renaissance. This photograph, by @nytimes staff photographer Fred Sass, was shot for an article about Zora and her program to combat juvenile delinquency in the community. But it never appeared in print." By nytimes on Instagram.